Creep is an effective horror film. Kate (Potente) is on her way to a party when she gets trapped in a London train station. That's not the least of her problems because she has to avoid the bloodthirsty monster lurking within. Creep works because of its limited, but scary, location. It also has atmosphere to burn. 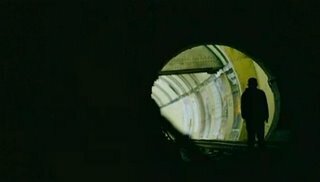 The movie is drenched in dark, and the only light is outside the tunnel. Potente does an good job as well. The movie has more suspense than gore in the first act, but when last act comes rolling around the blood starts to fly! I like that the director keeps the monster under wraps until the ending. Creep is a well-made horror film that's definitely worth watching.